In my last conversion rate optimization post – Optimize your checkout process to stop losing customers, I was showing what you lose if you don’t do CRO. And now, in this post, I would like to show you what you can get if you do it… On an example of my imaginary store. So, what is actually Conversion Rate Optimization? It’s the process of finding out why your visitors aren’t converting (doing the main goal you want them to do) and then fixing it. In eCommerce, main (or also called macro) conversion goal is converting visitor to a buyer. You can also have many side (micro) conversion goals like account registration, newsletter signup, add to cart, which basically help you achieve your main goal. With Conversion Rate Optimization your main task is to increase your conversion rate so you generate more sales without having to spend more money on bringing in additional traffic, which makes your marketing channels more effective and profitable. Lets take an example of how the optimization process actually looks like – on an imaginary store example. Let’s say that we have a store with 100,000 visitors and 2,000 transactions a month. The conversion rate on our site is 2,00% (transactions / sessions * 100 = conversion rate) and our average order value is $20. That means that we have a monthly revenue of $40,000 in our imaginary store. Now we have some basic numbers, when trying to optimize the conversion rate, we need to know why the rest of 98,000 visitors did not buy (convert), and fix it. This is what Conversion Rate Optimization is about. From the funnel we can see that half of the users who come to the product page do not add a product to the shopping cart. 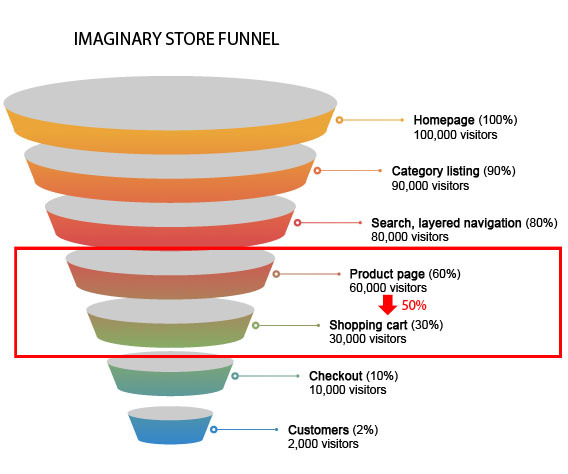 Only half of the visitors move to the next funnel step (30,000 out of 60,000). Understanding why visitors abandon the funnel is everything. On our imaginary store we found some issues and fixed them, we made add to cart button to be more prominent and visible in all viewports, added better product pictures, and a couple of other smaller issues we found. Let’s say that with these optimizations we got 5 percentage points increase in the number of visitors proceeding to the next funnel step, so now we have 33,000 visitors in shopping cart funnel step, which leads to 11,000 visitors in checkout funnel, and ultimately to 2,200 customers. With an average order value of $20, that means that the conversion rate optimization process got us $4,000 more in monthly sales. Great, let’s do some more improvements. In the checkout process we fixed some errors visitors encountered, implemented address autocomplete, gave Paypal checkout options to the customers, etc. Let’s say these checkout fixes gave us 5 percentage points increase in checkout completions, so now, instead of 20% checkout completions, we have 25%. Combined, our 2 optimization processes got us 750 customers more and $15,000 more in sales on the same number of users in our store. Some may say now that this is too perfect to be true, that you can’t work just like that, fix something and get better results, and that is true. These processes take time and lots of research, tests and work. But essentially that is what conversion rate optimization is about. Here is an example of one of our client’s results after 1 year of work on the store and constant improvements. Here we compared last year sales period with this year’s. Put in some 6-figure numbers and you’ll see how impressive even the smallest changes in CRO can be alongside SEO, paid search, social network usage and other growth hacking techniques. If you take your online business seriously, conversion rate optimization needs to be part of your eCommerce business processes! Are you wondering how you can increase your store’s conversion rate? Get in touch with us! i love the information thanks a lot!!!! What level of monthly traffic do you think is appropriate for stores to start thinking about CRO?